Planning4You LLC is now able to offer candy bars! We can do anything from bars to centerpieces whatever you want we can get! We would love to help make your day as sweet as you are! We will personalize anything! Your candy bar will be all about you! 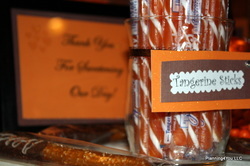 Candy bar pricing can start as low as $2.50 a person! We also do Cookie Bars! Cookies are always a great way to end the night! Planning4You LLC makes the cookies from scratch and can incorporate your own family recipe! Prices start at $2.25 per person!